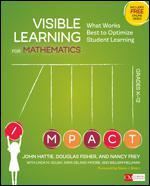 Join us for this year's Dine & Discuss series about Visible Learning in Mathematics, a book that discusses strategies that optimize student learning. What intentional choices can I make to optimize student learning? I can differentiate between surface, deep, and transfer learning. By registering for this conference, participants grant ATOMIM the right to use, in promotional materials, their likeness or voice as recorded on digital or analog media. Additionally, participants grant ATOMIM the right to share their contact information with major event sponsors and our affiliated organizations (ATMNE, NCTM, NCSM). To opt-out, email the Conference Registrar.